Cinco Saltos: general data - Cinco Saltos, Patagonia, Argentina. It is very close to Ingeniero Ballester Dam, which could be classified as the pillar of the fruit of the Upper Valley, thus there it is organized and distributed the irrigation in the area through the main irrigation canal. A work with many curves and slopes, and hence this town, which until 1932 was Colonia La Picaza, calls Cinco Saltos. 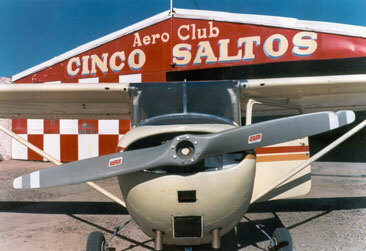 Aeroclub of Cinco Saltos. Photo courtesy of Fabian Serer. As already mentioned, is in the Upper Valley area 15 kilometers from Cipolletti and a few more from Neuquén. It was a colony that began to grow in 1918 when it was installed there an experimental farm which later would changed the way to grow fruit trees in the region. In 1932, by national decree, it was decided to name it as it actually does and it is currently home to 30,000 people approx. From Cinco Saltos, as in all the surrounding cities, you can visit the farms and productions of one of the most important fruit growing areas of the country and the world. Of course, you can have a look to the channel's falls. Just walk a few blocks from the center of town, on the Avenida Costanera, you will find them. You can also visit the fabulous work of Ballester Dam and the Faculty of Agrarian Sciences of the Nacional University of Comahue. And 16 kilometers is Lake Pellegrini, the spa town formed by the damming of Neuquén river. Its green and calm waters invite you to spend days in the sun and practice all kinds of watersports, from windsurfing and rowing to sailing, fishing and boating. In fact, there on the peninsula that forms the lake, it was built a village that functions mainly in summer with visitors from all over the valley. There are restaurants, campsites and cabins. In the lake is held during the month of February the Provincial Water Festival. 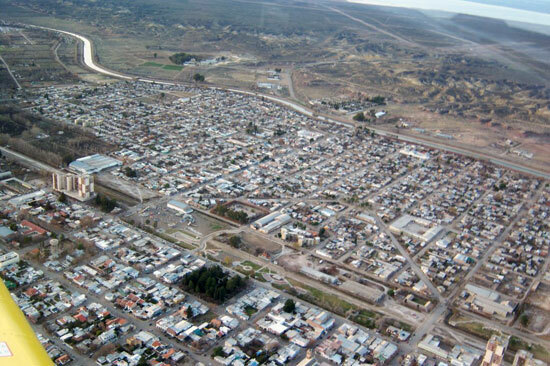 Aerial view of the town of Cinco Saltos. Photo courtesy of Fabian Serer. The phones of the municipality of Cinco Saltos are: (0299) 4980260 / 4980224. Provincial Water Festival in Cinco Saltos 5Since 1976 it is held in Cinco Saltos the Provincial Water Festival in Lake Pellegrini. The event takes place with a strong presence of locals and tourists.